The blog is about Total Cinema, and like Total Cinema, it is a work-in-progress. What do I mean by Total Cinema? I am talking about films in which there appears to be no limit on the imagination of the director/creators in terms of their ability to visualise and illustrate their ideas. The amazing whirlpool battle in Pirates of the Caribbean is an example, the seamless and invisible scaling of Gandalf and the Hobbits in Lord of the Rings another, the low-Earth orbit space sequences in Gravity, – and so on.. Mostly Total Cinema exemplars are those films that rely upon a large component of computer-graphics (CGI) in their production. But they are ‘Total’ also in their potential to integrate – and to illustrate – the many different components of digital art (see later). The essential back-story of Total Cinema can be traced from early 19th century theatrical son et lumiere presentations like those of Ettiene-Gaspard Robertson and Paul Philipdor, called Phantasmagorias (‘assembly of phantoms’, from c1802). Tom Gunning has written an essay about Phantasmagoria (Illusions Past and Future), as theatres of the senses, using illusions, stage magic, smoke and mirrors and importantly the Argand oil-lamp-powered magic lantern projector, and traces it’s transmutations through the 19th century into Symbolist Theatre d’Art (1891), mentioning the mid-century impact of Wagner’s theories of the Gesamptkunstwerk (1849). By the end of the century of course we have the technologies of the gas-light and electric-light powered magic-lantern slide projectors, and the emergence of various moving-picture systems, culminating in the feast of immersive media technologies at the 1900 Paris Exposition. And the cultural historian Marina Warner examines the Phantasmagoria of Robertson, in her book of the same name examining the mediated products of fantasy. 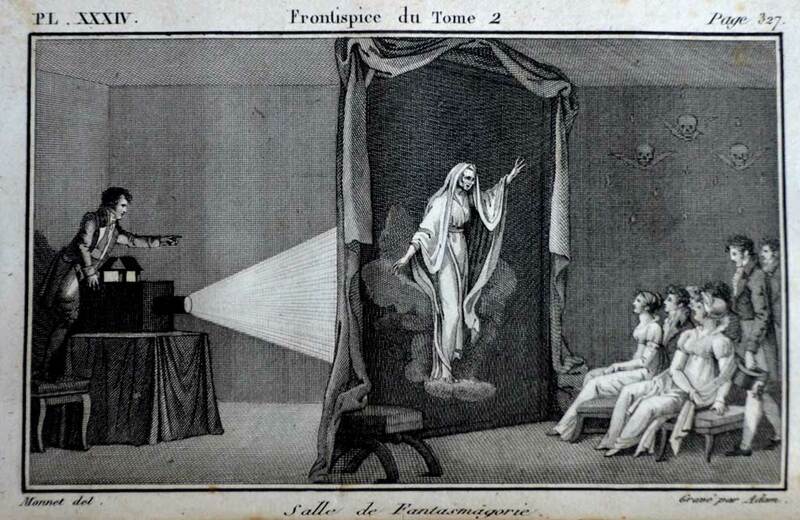 Paul Philipdor/Ettiene-Gaspard Robertson: Magic-Lantern projections in Phantasmagoria 1802. Robertson and Philipdor mounted their magic lantern on rails so that it could be moved backward and forwards to englarge and reduce the projected image. To an audience unused to large-scale moving images, this had a considerable shock effect. 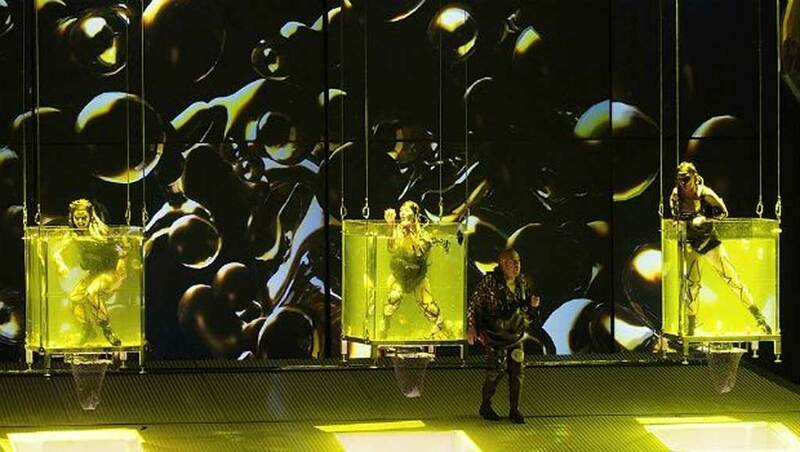 Fura del Baus: Das Rheingold at Houston 2013. Fura del Baus are an adventurous and innovative production company. This is their recent interpretation of Wagner’s Das Rheingold. It illustrates in contemporary media some of Wagner’s aspirations for a total (composite) art work, that he called Gesamptkunstwerk in his 1849 paper: The Artwork of the Future Das Kunstwerk der Zukunft. In 1967, I wrote a very juvenile but well-meaning (unpublished) essay on the Gesamptkunstwerk (Composite Art Work) for my degree year at Portsmouth College of Art. In summary it traced the immersive, multi-sensory and multimedia aspects of the theatrical arts from Greek Theatre through to 19th century music-hall, Richard Wagner, and into the 20th century via Edward Gordon Craig, Brecht, and Antonin Artaud, wrapping up with the then contemporary practitioners of immersive mediated environments, including Stan Vanderbeek (Moviedome 1963), John Cage and Al Hansen (Happenings 1959). Stan Vanderbeek: MovieDome 1963 Vanderbeek studied at Black Mountain College where he met some of the great experimentalists of the 1960s – John Cage, Richard Buckminster Fuller, Merce Cunningham, Josef Albers. Vanderbeek was an impressive film-maker, impressing amongst others, Terry Gilliam and Eduardo Paolozzi with his collage-montage animations. 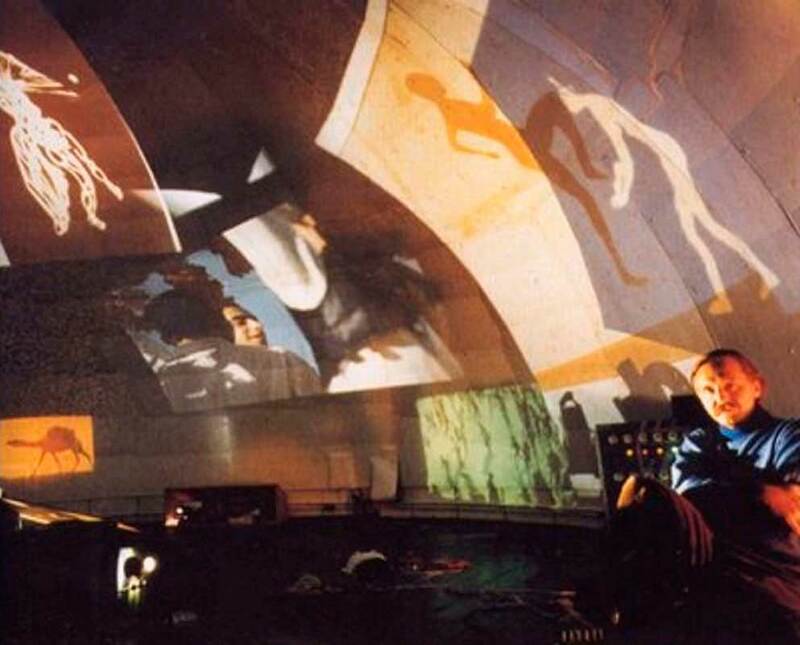 The Moviedome was a construction inspired by Buckminter Fuller (the geodesic dome), that housed multi-projection displays of Vanderbeeks films and slide archives. Edith Sitwell: preparation for Facade-An Entertainment from 1922. 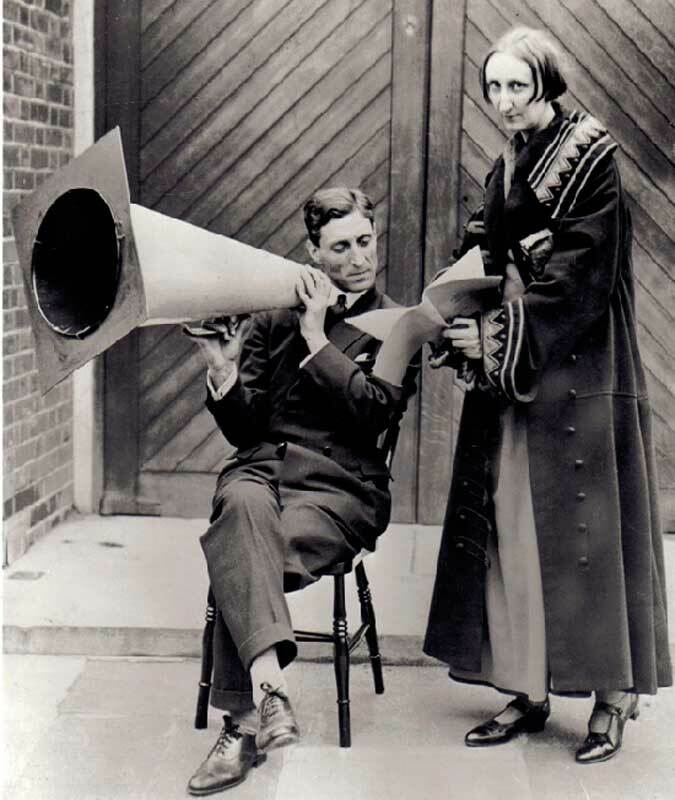 With music by William Walton and an improvised loud-hailer, Edith Sitwell performs her zeitgeist work, which received rave reviews for lots of formal innovations and later was made into ballet by Frederick Ashton. This kind of media-art-fusion, made highly contemporary by the improvised PA system, was another signpost on the multifold pathways to the art form of the 21st century. Gore Verbinski: Pirates of the Caribbean At Worlds End 2007. This was Verbinski’s third triumphant Pirates movie. I loved the way Verbinski compressed almost every possible cliche of the sea (Davy Jones Locker, Pieces of Eight, treasure-islands, ghost ships,) with new mythic hybrids, fusions of marine life and humans, – with all the facility of a great illustrator (see Mervyn Peake: Captain Slaughterboard Weighs Anchor, and Treasure Island). 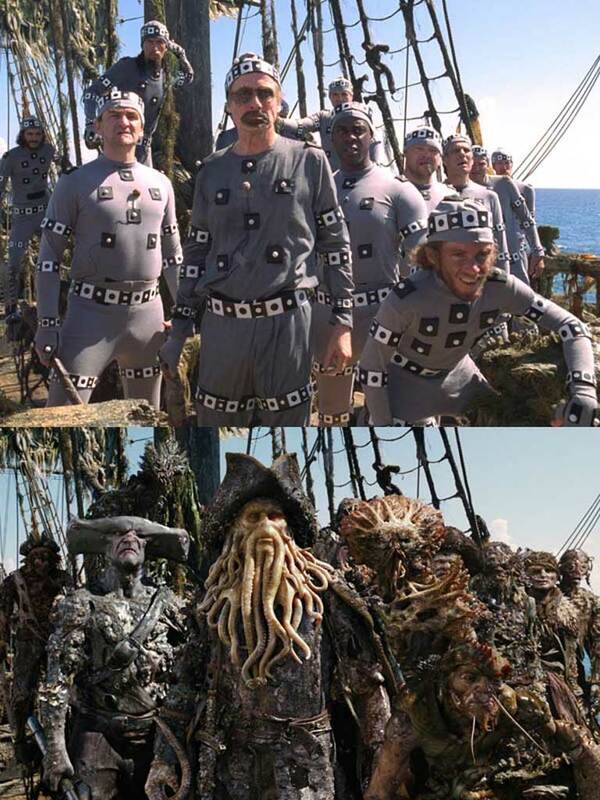 Here’s a binary shot of just one scene, showing the mo-cap performers rigged for motion capture, and the final scene. I want to wrap this idea up now by saying, along with Tom Gunning, Lev Manovich, and recently Kristen Whissel, that the developments I am going to trace in this series of blogs are the seedlings of a 21st century art form that will draw from these themes and iterate them into a coherent and continually developing series of new art-forms that will be as particular to the 21st century as Cinema, Television and Computing were to the 20th. And all or most of these forms will include moving images of some kind. The cinema may be dead, but the Movies will develop and expand, enveloping us in a new immersive form that will integrate multiple media, incorporate social media, involve interactivity, and provide us with limitless scope for self-expression, for recording the world, for communicating with others, for exploring ideas. This is the media of our time.